​ I put my hands over my head to reach the keyboard. I couldn't see the keys or read music, so everything was played "by ear". I didn't know what "perfect pitch" was, but I discovered that I could play along with the the ever-present AM radio with my little fingers. My dad realized I was having a difficult time with the big piano keys, so when I was 3 he got me a small kid size accordion with little keys and lessons. I could play this instrument well. All of a sudden I was dressed in a cowboy suit and 4 year old "Little Jackie Grassel" was walking out on stages to play solo with the "Bar 0 Ranch Traveling Variety Show". I played and sang the pop tunes of the day like "Cool Cool Water" and "You Are My Sunshine". Each gig paid $10 which was a lot of money for a 4 year old in 1952. At home, my mother used a timer and supervised my 30 minute practice session every day. But music had been a lot more fun when I could play along with the radio on the piano. I began to win contests and make money playing weddings with the accordion. That same year, Jim Brusky, the school band director, told my mom that he would give me free lessons on his upright bass if I would play it in the school orchestra. My 11 year old fingers were too small for the big instrument. It hurt, but it was great to get off the heavy accordion which hurt my back. The full size bass was a challenge for a little kid to carry around but I liked playing the low notes and grooving with the other musicians. combos and taught us how to play with each other and got us paying gigs at weddings, baby showers, anniversaries, and even bar gigs. There were different laws then, so I was able to play upright bass in jazz quartets in bars at age 12. There were many bands of adults that needed a bassist who could read and play the right notes, so there was a good paying gig for me every Saturday night at a wedding reception. The next year, 1961, brought a life altering development. The Triumphs, a popular rock band of seventh graders needed a bassist. Bob Zenoni approached me and said that if I would get a bass guitar I could be in his band. They played for good money at dances every Friday and Saturday night. Frank Cascio at the local music store offered a bass guitar and amp if I would make interest free payments with money from one of my gigs each week! So here I was, 13 years old playing 2 gigs a week at rock dances for teenagers. The bass guitar was easy and fun and it didn't hurt my fingers or back. We played the new tunes by The Ventures, Duane Eddy, Link Wray, Buddy Holly, Elvis and other pop music of the day. The girls couldn't (and still can't) resist a boy with a guitar . When I was 14, "Modern Music", a new music store opened near my house. I rode my bicycle a few miles to see the new equipment. While trying out basses, the owner asked if I would be interested in teaching bass guitar which was a relatively new instrument at the time. This was a significant event, since this opened the door to the path the rest of my life would take, playing and teaching music for a living. So, I was all set with a full schedule of students and was gigging 3-7 nights per week with many bands. I was "self-supporting" and bought a light green '62 Chevy convertible with a white top when I turned 17 and put "baby moon" hubcaps on it. . In high school, Mike and Dennis and I formed The Rivieras band to play "black music" by James Brown and Bobby Bland which was much more fun than school. I had a secret, exciting life playing in bars 5-7 nights a week in the downtown clubs 1963-66. Upon graduating from high school, I was burned out on music. I had been drinking, taking sleeping pills and caffeine pills in order to be in school every day after playing a gig every night. (Most gigs went 'till 2 or 3am.) At 17 years old, after falling down drunk in the middle of a gig, waking up ten hours later in a strange house, losing my car and not remembering what happened in between, I sold my bass and amp, quit playing music, quit drinking and enrolled in Pharmacy school. College didn't work out for me. Sitting in a classroom was boring compared to being onstage playing music. In 1966, ​at age 19, after 2 years of no music, I walked past a record store with $30 food money my mother had given me for the week. I heard jazz music coming out of the open door at Discount Records. Attracted by what I later learned was music by Cecil Taylor and Pharaoh Sanders, I went in. Many days were spent there with the clerk, Mitchell Covic, who played records and told me about jazz history which wasn't taught in school at the time. I put my $30 on the counter and asked him to pick out records for me from the discounted monophonic cut out bin. He said that horn players defined most of the jazz vocablulary and that I should digest the jazz saxophone repertoire. Excellent advice. Thank you for the education Mr. Covic sir. I listened to these records day and night for months and my view of the world changed. I went hungry, dropped out of school, bought a guitar and decided to be a jazz musician. My parents suggested I enroll in music college. I did, and discovered that I knew more about music than my instructors who had music degrees but never played any gigs. I learned there are differences between "full-time musicians" and "full-time music teachers". The classes, especially Ear Training were irrelevant because of my "perfect pitch". After 2 boring years of straight A's, without doing any school work, I was offered my first gig as a studio musician. I took the gig instead of the final exams, dropped out and returned to performing and practicing music full time. The correct choice. From 1971 to 1982, I worked 10-22 gigs per week, playing broadway shows in pit orchestras, backing big stars on their concert tours, playing rock, blues, jazz, country and ragtime in bars, playing classical music in symphony orchestras, presenting up to 10 jazz concerts per week in elementary schools, playing in The Larry The Legend radio show house band every morning at 7am. and tv / radio commercials in the afternoon in the recording studios. My busiest year was 1982 with 522 gigs, often playing 2-7 gigs in one day. That year I even played in the Ringling Brothers Circus band for a few weeks, which was the most challenging gig I've ever played. The book was 200 pages long and required an accurate presentation of every style of music and guitar technique in existence at the time. For example, I would read 16 measures of a difficult classical guitar piece, then stand up and play a Van Halen type solo, then sit down and read a complex melody line in unison with the horns, then stand up and play a bebop solo over goofy changes. There was no break in the music during the 3 hour show except for a short intermission. There were 8 shows a week and over early enough that I could run a few blocks carrying my guitar and start my 10:30pm six night a week jazz bar gig at the Pfister Hotel. I would have amps hidden or chained to stages all over the city so I could just run in, plug in and play. 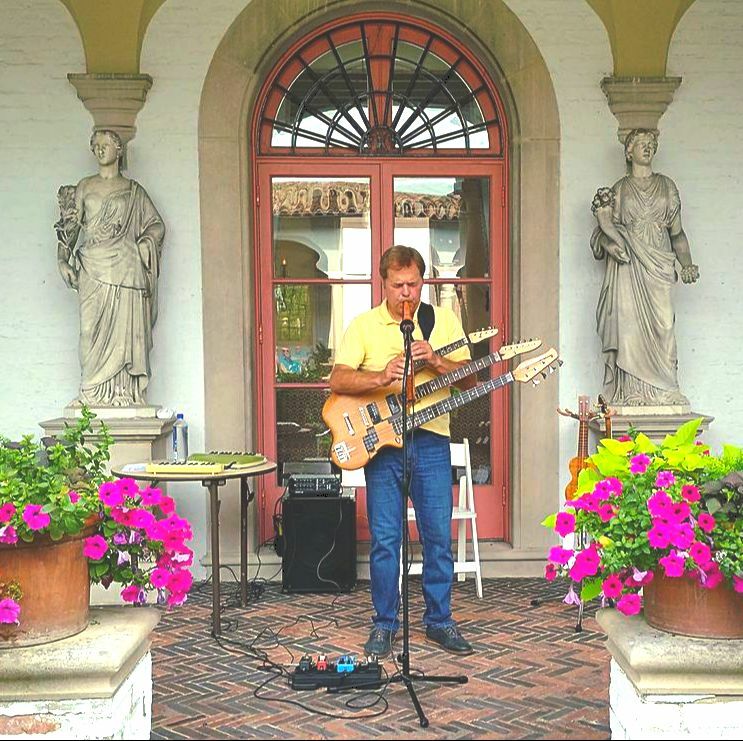 Studio and show work required an electric guitarist to double on classical guitar, ukelehle, mandolin, bass, bouzouki, banjo and keyboards and sight read anything. That was a great on the job education for me. In 1983, disco and other recorded music began to replace live music.﻿ Most of the studio work, show work, daytime gigs and six night a week jazz bar gigs stopped. This was also due to AIDS, fear of second hand smoke, stricter drunk driving laws, VCRs, home ﻿based entertainment and president Ronald Reagan's administration eliminating aid to the arts. I went from playing 10-22 gigs per week for 11 years to 2 gigs per week seemingly overnight. Many musicians had to get non-music "day jobs" to survive. The era of the full-time professional gigging musician came to an end. In the fall of 1983, ﻿with a family to support, I took a position as Chairman of the Milwaukee Area Technical College music department. My job was to design and promote a Music Occupations Program which generated a two year degree. I played jazz exclusively 2 nights per week and wrote 8 books and recorded 10 records during my 21 years there. Fortunately, their were many hours each day to practice in my office. The Dean of Fine Arts wanted me to be seen practicing as a good example for the students. My first record as a band leader "Magic Cereal" was released in 1986. It's important for a music instructor to keep advancing as the music world and his students advance. In 1998, I married vocalist / actress / TV personality Jill Jensen and discovered that special music can be made by two people in love. I left MATC in 2004 since it again became possible for me to make a living as a full time musician. Here's Jill and me onstage in the U.S. in 2011. 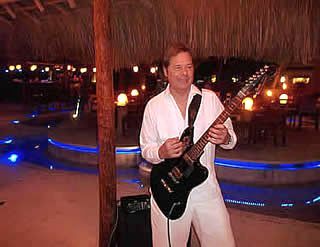 In 2013 playing a gig at Fenix in Isla Mujeres. In 2013, in order to give Jill the musical backing she deserves,​ I built the triple neck, mandolin-guitar-bass and began using a looper to overdub, creating an entire band in front of an audience. In adding the melodica to my "act", I added my earlier experience as a keyboardist. ​exciting people, and am having great fun being a musician. ​ Ciro the Cuban conga virtuoso and me with a melodica doing an afternoon gig at Fenix on Isla Mujeres January 2018. My 20th CD, JACK 2015, was completed in the summer of 2015 which documents most of my explorations with 11 instruments and a return to singing after a long hiatus. It will be interesting to see what happens next.